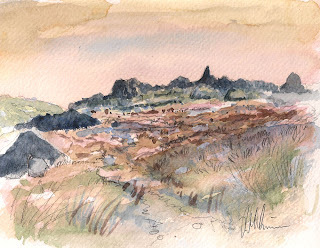 This little watercolour demonstrates using a mixture of warm and cool washes. I am editing the video of this painting being produced. I used SimmTrace™ for the drawing again, sorry to be mysterious but we are finalising the design, and other bits and pieces. The view is of a ridge of Boulders near the old man of coniston in the lake district.